Does anyone have load data in .223 for the 55 grain Barnes TSX using Varget and Benchmark. I can't find it on there web site. I Emailed them 4 days ago and haven't received a responce. Joe, I'm assuming you want the 53gr........they don't make a 55 !!! As you can see they don't list Benchmark. Thanks for the data chambered. Barnes just came out with a 55 grain bullet and it was after their last manual was published. They don't even have any limited load data in their technical section. I sometimes wonder if they did a 55gr version because 55gr is the norm for .223 and expected better sales. I may get some and try them. I just got some H4895 and I've got Varget. 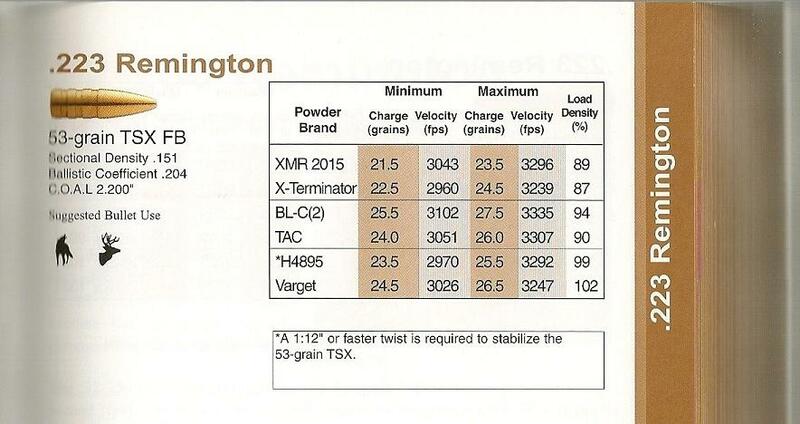 I expect that this load data will apply to the 55 grain also. Oh, I will also shoot my 62gr TSX BT at 200 yards this weekend to see how the accuracy is. They are shooting fine at 100 yards. I like the idea of a 53 or 55gr bullet as it will be lighter, faster, and more stable than the 62gr out of my 16" barrel. It would have made more sense (to me anyways) to make the new 55 with the blue tip thingy !!! I see they also make a 55gr. MPG bullet now but my book is to old for that too. make the new 55 with the blue tip!!! the challenge with adding a poly tip to such a small bullet is it signficantly increase its length which takes more twist to stabilize it. These all-copper bullets are about 18% lighter than a lead-core bullet so they are longer to begin with for the same weight. Thus, Barnes can provide a more stable bullet that weights 55 grains by not using the poly-tip. Stability issues is why shrpshtrjoe is switching from the 62gr TSX to the 55gr TSX. 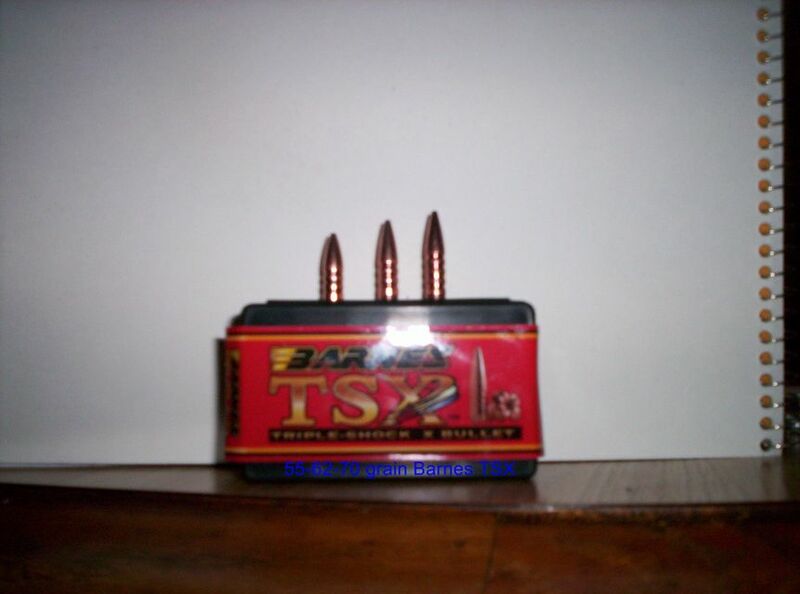 As an example, with the 110gr Barnes bullets for my .270. The poly-tip adds 0.095" in length which has a signficant impact on stability. Now take a bullet half that size and the difference is even greater. The MPG bullet is a compressed metal dust core. Its also longer for a given weight. Because of its different construction, I'd not sure if I'd use its data for the 55gr TSX. If I did, I do it with caution. shrpshtrjoe, can you post a picture of the 55 and 62gr bullets side-by-side? I'm thinking that they just didn't include the boattail on the 55. Thanks for the Data Chambered I guess I will use the 53 grain data and start light . I can't find 55 grain tsx data anywhere and Barnes still haven't emailed me back yet . Slim the 55 grain is a flat base I will post pics this weekend of the 55 -62 and 70 grainers side by side. A grain or two here or there in bullet weight doesn't really matter all that much. Although the type of material used to make the bullet needs to be taken into account for most part it too doesn't change things a whole lot. If you were to study all the different re-loading manuals you will see that most data for a given weight are pretty close to one another. Most of the differences are due to variables such as different primers being used, the amount of bullet in the case because of style and shape differences, the barrel they're shot through, etc, etc. What it primarily boils down to is the amount of resistance that the mass creates. So as long as your practicing the start low work up theory (I know most of us do that) things will work out just fine. Joe, Don't be afraid of compiling some Benchmark data from a number of other bullets and doing just that if you really want to use it. I will post pics this weekend of the 55 -62 and 70 grainers side by side. Joe what were you going to use the 70gr for and in what rifle and twist? shrpshtrjoe, Thanks for the picture. A wee-bit fuzzy, mate as Vince would say. Looks like the 62gr and 70gr have the same nose profile but the 70 is longer. I thought the 55 would be a 62 with the boat-tail removed but it looks like it has a shorter nose. Thanks for confirming the lengths. That is a significant difference in length. The 55gr will be much more stable in our 1:9 twist 16-inch barrel.